Portland isn’t exactly in the heart of gold country. The two rich gold-bearing areas in Oregon are in Eastern Oregon and Southwest Oregon, several hours from Portland. Still, there are some places relatively close to Portland where small quantities of gold can be found. The Molalla River has some very limited quantities of placer gold. Gold found here is almost always very fine textured and in limited quantities. 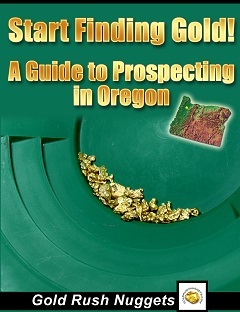 It is certainly not as gold rich as many other areas in Oregon, but it is located near Molalla and is a popular destination for prospectors who live in the Portland area. The Molalla River Recreation Corridor is an area that you can likely find some gold… contacts the Salem District BLM for additional information. The Ogle Mine is located on Ogle Mountain at the headwaters of Ogle Creek. There have been small amounts of placer gold found in Ogle Creek, and is possibly the source of the gold that is found in the Molalla River. You are not likely to strike it rich, but still a decent place to look for some “color” a short distance from Portland. Very small amount of placer gold can be found in many of the creeks and rivers that flow west out of the northern Cascade Range. In addition to those previously mentioned, there is at least some gold to be found in the McKenzie, Santiam, Clackamas or any of the waters that flow into, and including, the Willamette River. It should be understood that although there is gold here, it is almost always extremely fine and limited quantities. Quartzville is an old mining town located northeast of the town of Sweet Home, and is probably the closest area to Portland that actually has good gold. There is a very popular area called the Quartzville Recreation Corridor that is located on Quartzville Creek upstream of Green Peter Reservoir. This is an area that has been withdrawn from mineral entry and is not claimed for several miles so anyone can go gold panning there. Many lode mines and prospects are found in the area around Quartzville. Placer gold deposits are found in Quartzville Creek, Dry Gulch, and Canal Creek. The gold found here is generally very fine. The area around Quartzville is one of the northernmost places in Oregon’s Cascade Mountains with placer gold, along with the very limited quantities of gold that can be found in the Molalla River as mentioned previously. The East Fork Lewis River is a popular area to prospect for gold in Clark County. Although the placers found here aren’t noted as being particularly rich, it is an accessible place for prospectors who live in the Vancouver and Portland areas, and are generally considered better paying than most other areas within an hour of the Portland area. Fine gold can be found all throughout the river down to its confluence with the Columbia River near Woodland. There are also reports of fine gold in the creeks around Brush Prairie south of Battle Ground. Another popular area for prospectors who live in the Portland/Vancouver is a few creeks in Skamania County that contain placer gold deposits. One good area to explore is around McCoy Creek, a tributary to Yellowjacket Creek in the Gifford Pinchot National Forest. Camp Creek is located on the southwest flank of Juniper Peak, and flows into McCoy Creek. There are many small drainages around McCoy Peak, Langille Peak, Juniper Peak, and Sunrise Peak that may be worthy of further investigation. Surprisingly to some, there is actually fine gold in the Columbia River. The richer areas are much further upstream, but trace amounts of gold can be found just about anywhere in the Columbia. Don’t expect to strike it rich mining for gold around Portland, Oregon. The geology here isn’t ideal for producing significant gold deposits, and no historically large gold discoveries have been made here, but very fine textured gold dust can be found in any of the waters mentioned in this article. Careful gold panning technique will be required to successfully find gold here. 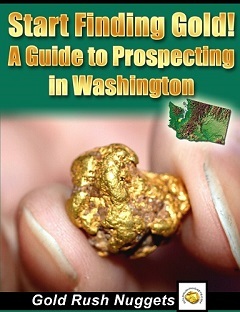 Always make sure that you are in an area that you can legally prospect for gold. Much of the forest land around Portland and Vancouver is private timber lands, which may have restrictions about gold prospecting. Always check with the appropriate land manager prior to heading out.